A.J. Dillon (center) had a breakout season for Boston College in 2017, rushing for 1,589 yards. 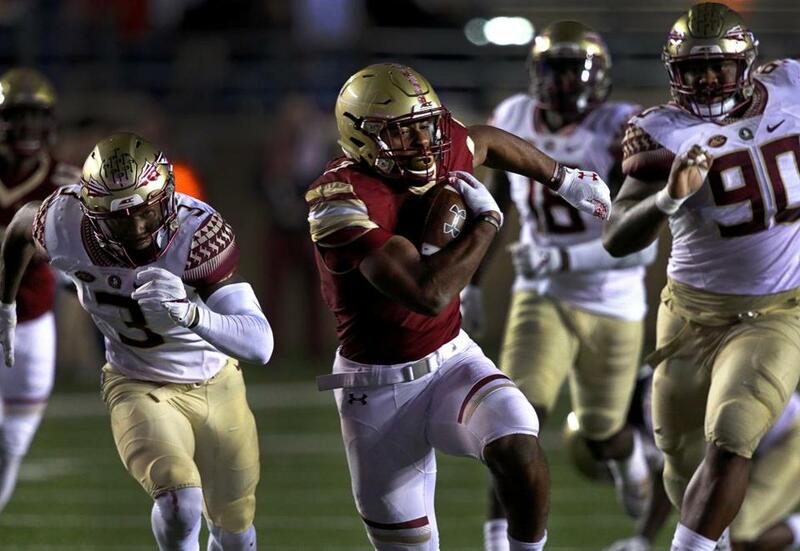 Outside expectations don’t bother Boston College back A.J. Dillon mostly because he keeps a running list of his own almost everywhere he goes. A year ago, when the rest of the Atlantic Coast Conference barely had the faintest clue about who he was, Dillon had a checklist taped to his bed. He crossed them off one by one in a breakout season that made him the easy choice for ACC Freshman of the Year. Now he’s pegged as the conference’s preseason player of the year and, naturally, he’s still got his checklist handy. “They’re on my locker, on my bed, in my backpack, and right on my wallpaper on my computer,” he said. The buzz around Boston College football starts with the curiosity about what Dillon will do for a follow-up after smashing the Eagles’ freshman rushing record with 1,589 yards. That same buzz made the atmosphere Friday at BC’s first preseason practice much different than years past. In five seasons under Addazio, the Eagles have put together four seven-win seasons and gone to four bowl games. The challenge they now face is pushing through into the next tier of the top-heavy ACC. With a slim margin for error, identifying and improving weaknesses — from sudden-change situations to third-down run defense — will be critical in making that leap. “We’re trying to take all the things that we have identified that were things that we need to improve and we’re systematically attacking those so that the whole team can see, ‘OK, this is what we worked on, this is how we got better at it, and that’s how we’re going to take another step,’ ” Addazio said. Christening the $52.6 million Fish Field House, the Eagles were nearly at full strength. The only player unable to practice was offensive lineman Elijah Johnson, still recovering from a knee injury. Quarterback Anthony Brown made his return after suffering a season-ending knee injury last November. Center Jon Baker, who missed all but one game last season because of a knee injury, was also back on the field. “What we try to do on Day 1 is keep things vanilla,” Addazio said. “On defense, we’re not running like blitzes and pressures and movements and twists. Just kind of playing base and zone coverage. For as splashy as his freshman season may have been, he said he’s already turned the page. He’ll go into this season as a known commodity, but said he’s eager to showcase a broader skill set. “I’m the type of person to never really be complacent or satisfied with anything,” he said. “Even in high school, I always wanted to be better. People might know me this year, but I go into it like it’s Day 1, like I went into it last year. I have a lot to prove. Nothing’s given. He’s embracing the hype that’s already come his way before the season, but put it in proper perspective. “Something I feel like we do really well — and that kind of starts with our coaches and comes down to us — is handling the external factors,” Dillon said. “Expectations, I don’t really worry about besides my own personal expectations.